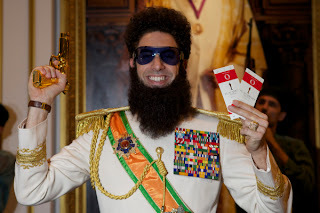 Sacha Baron Cohen will be attending the Oscars...he will attend as his current character General Aladeen from his upcoming movie The Dictator. Earlier this week the Oscars had told him that they were not going to let him attend, even though he was in Hugo which was nominated for Best Picture. They think that he is going to show up and be a gong show on the red carpet as General Aladeen. Who cares if he does or not? It's hilarious...and the red carpet can be such a bore. He would liven it up a little. Anyways, the press picked up that he was told he couldn't attend and then the Academy looked like dicks, so they recanted and sent him tickets. Now I really hope he is a gonger. Love his insanity.